The Soleil was one of the first kiteboards designed by women for women, and that concept holds true today. Completely redefined, the Soleil is now offering the Space Flex Technology. 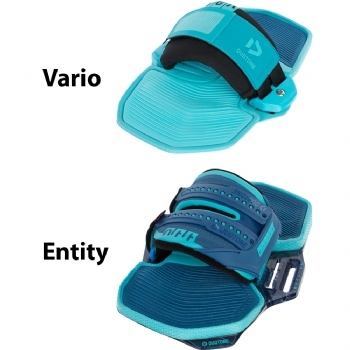 The Carbon Beam construction provides the board with a lively feel that is very reactive to rider input. Rail to rail carving is a dream while the pop is impressive. The softer flex in combination with the Space Flex Technology ensures the ride is smooth, even on the choppiest of days and the Step Mono Concave bottom gets you going early. Due to the new grab rails, the light weight and the narrow width of the board, it becomes much easier to handle and to control, even in windy and rough conditions. 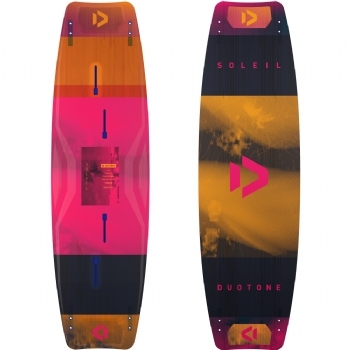 Many brands go with the "pink it and shrink it" approach, with the Soleil you get a female specific board that was designed and built from the ground up for women. You deserve something special; the Soleil was made just for you! Premium Construction: The Premium Construction boards Jaime, Select and Soleil feature Carbon Beams, where parts of the glass fibre are being replaced by unidirectional carbon beams to noticeably improve the board's performance. This results in a faster and even more progressive flex for better pop and reduced weight.